Kansas City Convention and Tourism Bureau. US Census Bureau, Kansas City Region. Wyandotte County Economic Development Council. K-12 TLC Guide to Kansas Artists. K-12 TLC Guide to Missouri Artists. K-12 TLC Guide to Kansas Authors & Illustrators. K-12 TLC Guide to Missouri Authors & Illustrators. Kansas City, Kansas Public Library. Strawberry Hill Museum and Cultural Center. K-12 TLC Guide to Kansas Explorers, Pioneers & Aviators. K-12 TLC Guide to Missouri Explorers, Pioneers & Aviators. K-12 TLC Guide to Kansas Business Leaders. K-12 TLC Guide to Missouri Business Leaders. K-12 TLC Guide to Kansas Composers. K-12 TLC Guide to Missouri Composers. K-12 TLC Guide to Kansas Mathematicians & Scientists. K-12 TLC Guide to Missouri Mathematicians & Scientists. K-12 TLC Guide to Kansas Performing Artists. K-12 TLC Guide to Missouri Performing Artists. Bacharach, Burt: K-12 TLC Guide. Parker, Charlie "Yardbird": K-12 TLC Guide. K-12 TLC Guide to Kansas Political Leaders. K-12 TLC Guide to Missouri Political Leaders. K-12 TLC Guide to Kansas Sports Figures. K-12 TLC Guide to Missouri Sports Figures. Kansas City Board of Trade. K-12 TLC Guide to Kansas Education. K-12 TLC Guide to Missouri Education. Kansas City, Kansas Public Schools. Kansas City, MO School District. 2000: Schools Lose State Accreditation (audio: 4:30). 2010: Mass School Closures Approved In Kansas City, Missouri. K-12 TLC Guide to Kansas Libraries. K-12 TLC Guide to Missouri Libraries. Kansas City, Missouri Public Library. K-12 TLC Guide to Kansas Museums. K-12 TLC Guide to Missouri Museums. The Children's Museum of Kansas City. Kemper Museum of Contemporary Art. Liberty Memorial Museum of WWI. The Toy and Miniature Museum of Kansas City. K-12 TLC Guide to Kansas History. K-12 TLC Guide to Missouri History. K-12 TLC Guide to Westward Expansion. Biography of Charles F. Morse, Kansas City Public Library. A History of Kansas City, MO. Parks and Recreation Department Archives. Club Kaycee: Kansas City Jazz History, University of Missouri-Kansas City. The Heritage League of Greater Kansas City. 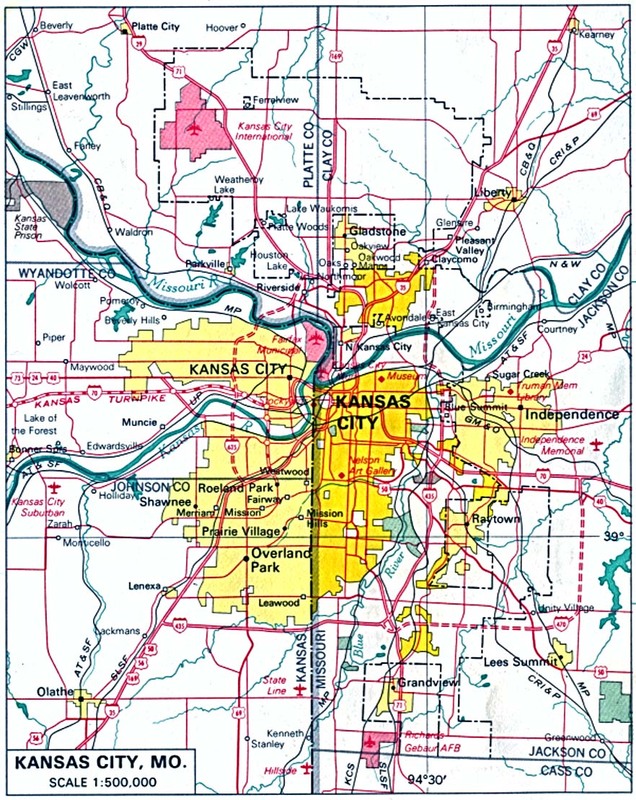 Pictorial History of Kansas City and Wyandotte County, Kansas. History of The Kansas City Star. 1859 Jail, Marshall's Home & Museum. Harry S. Truman Office and Courtroom. Local History Database, Kansas City Public Library. Kansas City Southern Historical Society. Hemingway, Ernest: K-12 TLC Guide. Ernest Hemingway and The Kansas City Star. Hemingway and Kansas City: A Literary Tour. Hemingway Quotes, Anecdotes and Letters. Where Hemingway Worked and Lived. Lewis and Clark Historical Park at Kaw Point. Lewis and Clark in the Kansas City Area. Truman Presidential Museum and Library. Herbert Hoover: K-12 TLC Guide. Dedication of Officers and Council. Dedication of Officers and Council 2. 1976 Republican National Convention (Aug 16). Wyandotte County, Kansas in the Civil War.